We are the designated distributor & exporter of Smith Bearings. H&H Exports offers direct access to Accurate Bushing inventories for exportation and international distribution. With responsive service and quick lead times, H&H will get you the quality Smith Bearings you need. Total guarantee of privacy: Your information will only be used to provide you a prompt quotation. We assure you that we will not use your email address to send you promotional or advertising material. We guarantee we will not share your personal information with any other company. H & H Exports is an authorized distributor/exporter for Accurate Bushing Co Inc.
At H&H Exports we specialize in finding exactly the right component for you like these Smith bearings including Smith Jig Bushings, Smith Cam Followers and Smith Track Rollers. SMITH BEARING offers a superior line of CAM FOLLOWER needle roller bearings in inch & metric sizes. Stainless Steel Cam Followers for special corrosive applications. Cam followers with self-lubricating engineered plastic bushings. SMITH-TRAX with tapered roller bearings and deep-groove ball bearings for high-thrust load applications. CUSTOM ENGINEERED PRODUCTS & ANCILLARY BEARINGS and DRILL JIG BUSHINGS. SMITH BEARING, with corporate headquarters in Garwood, New Jersey, serves the global market place with a network of Industrial and Aerospace distributors, manufacturing plants and sales offices throughout the world. Smith Bearing is a registered trademark of Accurate Bushing Company. With over 50 years experience in designing and manufacturing precision needle roller bearings we can handle your requirements for aerospace and industrial bearings, as well as custom manufactured special bearings, assemblies, and bushings. Smith Bearing has a fully-integrated manufacturing facility capable of producing high-precision needle roller bearings for both the Aerospace and Industrial market. Smith manufactures bearings in a wide range of materials including high-carbon alloy steels, stainless steels, tool steels, and other exotic alloys. Staffed by a highly trained and experienced engineering department and sales staff, Smith Bearing can assure the highest standard of care and service the industry can offer. Smith Bearing has received both ISO9001 and AS9100 quality registrations in recognition of its continued commitment to world-class quality control systems. Smith’s quality system is well recognized throughout the industry. 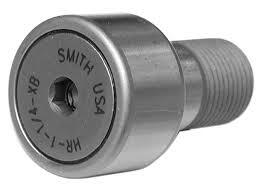 SMITH offers a complete line of stud type and yoke type cam followers for industrial applications. These bearings are available in steel, stainless steel, and with engineered plastic internal bushings. SMITH specializes in engineered cam followers to fit specific applications. The SMITH-TRAX® special duty track roller bearings are machined from high-alloy steel and are case-hardened for maximum longevity. These bearings are fitted with deep-groove ball bearings or tapered roller bearings to handle both high radial and thrust load applications. ABC Drill Jig Bushings are manufactured to ANSI standard tolerances and produced from select steels known for their long wear and stability. Special bushings are available. Contact us with your requirement. At H&H Exports we specialize in finding exactly the right component part for you like these Baldor products. We invite you to inquire with us for any of these Baldor products including AC Motors, AC Controls, DC Motors, DC Controls, Gear Products, Motion Control, Servo Motors, and Servo Controls.